EdTech 2012 will be held at NUI Maynooth on May 31st and June 1st 2012. NUI Maynooth has approximately 8,400 registered students. The university has 26 academic Departments which are organized into three Faculties: Arts, Celtic Studies and Philosophy; Science and Engineering, and Social Sciences. It is located on a pleasant university campus in Ireland’s only university town 20km west of Dublin, and has recently undergone a major phase of expansion in research, teaching and service facilities. The spacious campus is laid out in its own extensive grounds in rural surroundings, and is divided between an older complex of fine nineteenth century buildings and a modern complex of teaching, research, accommodation, and support facilities. NUI Maynooth is accessible by public transport from most parts of the country. The town is well served by two Dublin Bus routes, Dublin commuter and National rail links, Bus Eireann national bus routes as well as several private daily commuter and weekly coach routes. The university is located 15 miles from Dublin city centre and is also easily accessible by car. For a map of the venue and car parks, click here. Conference accommodation is available on campus at NUI Maynooth and can be booked through the campus website at: www.maynoothcampus.com. Use the code ILTA03-12 to access discounted academic rates on campus accommodation. 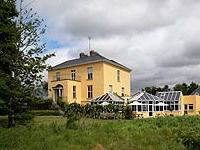 The conference dinner will take place on the evening of May 31st at Becketts Hotel Cooldrinagh House in Leixlip, in this beautifully restored manor house dating back to 1760, just a short drive from NUI Maynooth.